You are currently browsing articles tagged colour series. Even though there are not many flowers whose natural season is winter, there are still plenty to choose from. 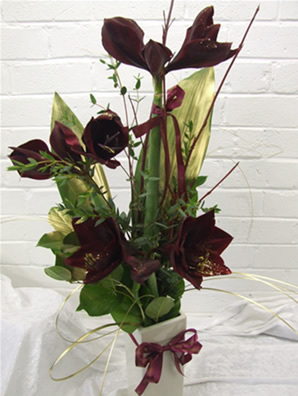 Such as roses, amaryllis, freesia, lisianthus and lilies. As well as exotics from the southern hemisphere such as gingers, orchids, proteas, kangeroo paw and euphorbia. Some early spring flowers also are obtainable such as rannunculas, tulips and narcissi. With the short days and dark nights in winter, rich colours can really brighten up a room and create a warm, inviting atmosphere. Velvety reds with dark glossy foliages or jewel colours with beads and luxurious ribbons add texture and colour into a room. Another popular winter look is icy whites and silver with pale blue accents for a frosted winter wonderland. With crystals added for a touch of glamour and sparkle. Of course all winter wedding flowers are brought to life by candles. Whether using tiny tea lights dotted around the room, chunky church candles in hurricane lamps or glamorous candelabras dripping with flowers, crystals and flickering candles. They create a wonderful romantic ambiance. Rather than trying to match colours exactly, a more pleasing effect can be achieved by picking shades of the same colour. This also applies to any others items you are chosing such as stationary or chairs bows. Selecting several shades of one colour can help give a colour scheme more depth and can soften a look. As well as making life a bit easier for you, rather than getting hung up trying to match a long list of things to one swatch of fabric. You should have booked your venue by the time you start to think about your colour scheme. The style and décor of your venue will be part of the look on your big day so don’t forget to look to the colours in your venue for inspiration. Many older buildings will have more classical decoration with patterned wall coverings and carpets. 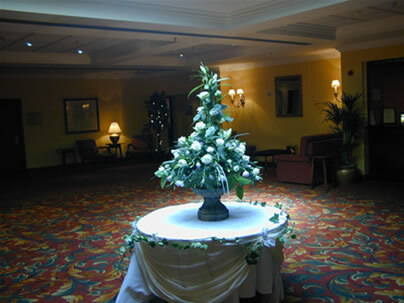 So a thoroughly modern and contemporary theme for your flowers might look out of place in that type of venue. On the other hand you may have chosen a modern hotel that would look fabulous with contemporary flowers. Choosing colours to complement your venue will give a pleasing look. If you are unsure or don’t want to be swayed by the colours in your venue, a neutral colour scheme of cream and whites with greens would suit most surroundings. This is the last blog in our colour series. I hope they have provided you will some useful information and inspired you to pick the perfect color palette for your wedding. The summer months are abundant with fresh flowers and the best time of year for English grown flowers too. It’s an especially good time for all shades of pinks and purples, it brings beautiful peonies from whites and pale pinks through to deep burgundies. Hydrangeas with gorgeous fat heads in many colours. Delphiniums, sweet peas, dahlias, cornflowers, scabious, asters, sweet william, snap dragons, stocks, astilbe, lilac. The list of summer flowers is never ending. During a season with so much natural light there are no limitations to colour schemes either. Country garden themes work as well as crisp whites and greens or a more tropical look of hot pinks, limes and oranges. Several summer flowers continue into early autumn. Although autumn itself provides many wonderful colours from rich reds to burnt oranges and golden shades. With the wealth of wonderful leaves and berries available at this time many brides choose to go for a natural look. Using bark, twigs, leaves and decorative gourds as accents in floral arrangements of rich shades such as oranges, reds and golds. The chrysanthe comes into it’s own during autumn with various large single blooms in warm shades of bronze and gold. English chrysanthemum blooms are available too in autumn. For brides preferring a contemporary autumn look there are many exotic looking flowers to keep the look modern. 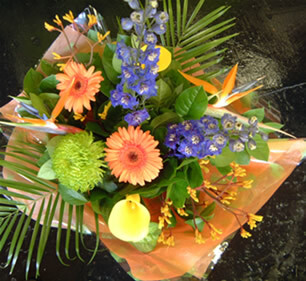 Such as Birds of paradise, pincushion proteas and mango calla lilies. 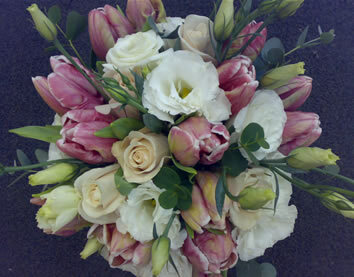 The next blog blog continues with the perfect flowers for a winter wedding. As well as tips on how your venue could help determine your colour scheme. 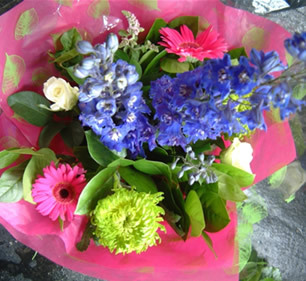 Flowers that are in season are generally the best quality and price, as they are abundant in their natural season. They are also greener. Although some flowers can be sourced out of season if you have your heart set on a particular flower, expect to pay a premium for those flowers. As they are often grown abroad and are shipped in especially. Sometimes suppliers also require a minimum number is ordered for special orders. For example, it might not be feasible to use tulips in only one arrangement during the summer months. 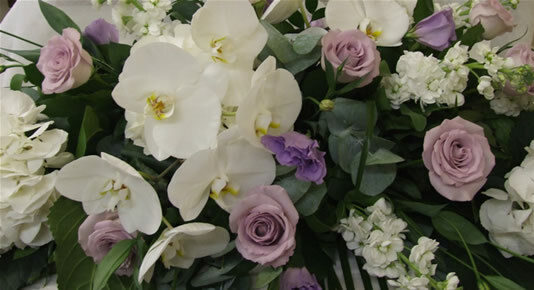 There are of course a lot of popular wedding flowers available all year round such as roses, lilies and gerbera. Flowers that have a short season seem even more precious, because of the short time they are available for. Couples that choose seasonal flowers will also have the added joy of seeing their wedding flowers blooming in gardens around the time of their anniversary every year. When you think of spring, you might think of daffodils, tulips and hyacinths. Bulb flowers are synomonous with spring. Such as anemones, lily of the valley, narcissi and rannunculus. Tulips alone are available in hundreds of colours from soft pinks and creams to deep reds and rich purples. There are plenty of colours to choose from in spring, whether you want pretty pastels or vibrant clashing tulips. Although bright shades are always a tonic when the weather is unpredictable in early spring and can help to bring the sunshine inside. Scented flowers are plentiful at this time of year, Hyacinths, lily of the valley and narcissi all have fabulous sweet scents. 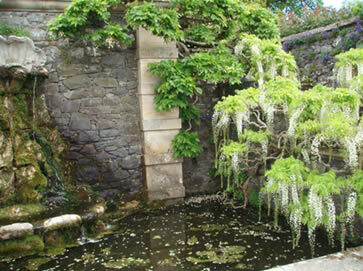 Late spring brides are also treated to fabulous blossom on fruit trees, wisteria and laburnum. 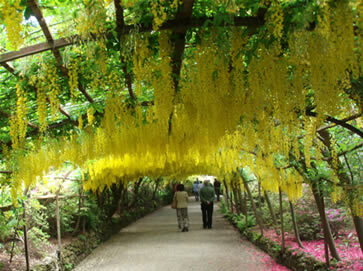 The above photographs were taken at Bodnant Garden in Wales, their famous laburnum arch is in bloom from late May to early June. This week I’ll be doing a series of special blogs on colour to help you choose the perfect colour scheme for your wedding day. If you have any questions throughout the series please leave a comment and I will try and answer them. The colours for a wedding are one of the first decisions a couple will make that affects the whole look and feel of their wedding day. So it understandably is an important decision and shouldn’t be rushed into. Take time to think about the how you want your wedding to feel and the mood you want to create. Below is a short guide to the moods different colours can create. Red is the warmest and most energetic colour it can help make a winter wedding feel warm, inviting and romantic. Orange stimulates and warms, it also evokes excitement matched with darker earthy tones. Green has a calming and relaxing influence, it gives a very simple yet sophisticated look mixed with whites. Blue is peaceful and tranquil, pale blues mixed with silver and whites give an icy cool feeling. Purple, the colour of royalty, luxurious and opulent. 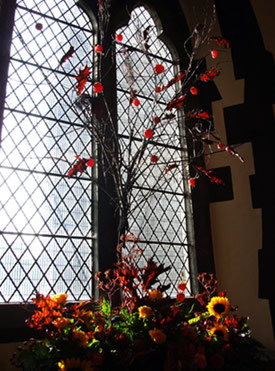 It can look very rich and dramatic mixed with deep reds in autumnal weddings. Pink is a tranquil and romantic colour, often used in shades from pale blush pink to deep cerise in summer weddings for a country garden feel. The next blog in this series will look at what flowers are in available at the different times of year and which colours are best suited to the seasons.